The Ralph G. Beelke Gallery in Creative Arts Building Two will host Jill Downen: Anxious Architecture from August 20 through September 14, 2001. 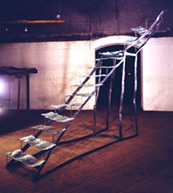 Downen’s sculptural installations reconstruct architectural spaces based upon memory, reverie and imagination. 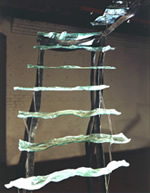 Her use of fragile materials in structure, such as a warped glass staircase, raise issues of contradiction and functionality and make us aware of our relationships in personal spaces.